HÀ NỘI – The Central Steering Committee for Anti-Corruption convened a meeting in Hà Nội yesterday chaired by Party General Secretary Nguyễn Phú Trọng, head of the committee. Members discussed the progress, results, difficulties and obstacles regarding the investigation, prosecution and trial of cases under the supervision of the committee. They agreed to complete the investigation, prosecution and trial of 12 cases under the supervision of the committee in 2017, including those involving Saigon Thương Tín Commercial Joint Stock Bank, Tiên Phong Bank, Bank for Investment and Development of Việt Nam and the State Bank of Việt Nam. 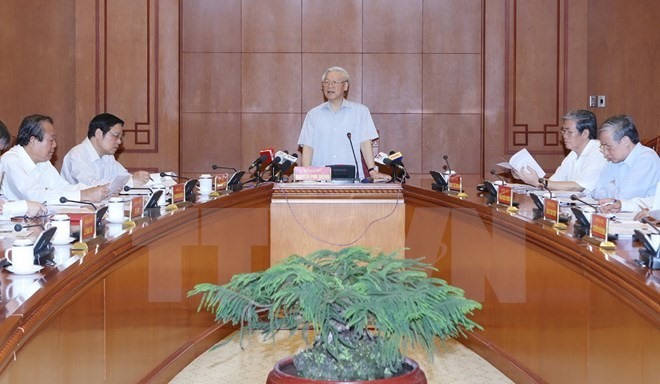 They also asked relevant agencies to further investigate the case involving PetroVietnam Construction Corporation (PVC), and pursue and extradite its former chairman Trịnh Xuân Thanh. The committee agreed to establish eight working teams to inspect and supervise the prosecution, investigation, and trial of complicated and serious corruption and economic cases of public concern in 20 provinces and cities nationwide. Addressing the meeting, Party General Secretary Trọng commended the efforts of various law enforcement agencies in the investigation and prosecution of 11 defendants involved in embezzlement and in "deliberately acting against State regulations in economic mismanagement, causing serious consequences" at PVC. He urged continued perseverance in the cases against Hà Văn Thắm, former chairman of Oceanbank, whose malfeasant practices caused losses of VNĐ2 trillion (US$88.1 million), and Phạm Công Danh, former chairman of Việt Nam Construction Bank, a central figure in a VNĐ9 trillion ($396 million) loss. He lauded the recent efforts of agencies as well as members of the committee, which have brought remarkable results. However, there is much work to be done, requiring closer co-ordination among authorised agencies, he noted.